October 30, 2013: Following a theatrical run that marked its first appearance in North America after a long absence, Far From Vietnam , the "crucial" (The New Yorker) anti-war collaboration between the greats of the French New Wave, will appear on home video DVD and VOD for the first time on December 3, 2013 from Icarus Films Home Video. Initiated and edited by Chris Marker, Far From Vietnam is an epic 1967 collaboration between cinema greats Jean-Luc Godard, Joris Ivens, William Klein, Claude Lelouch, and Alain Resnais in protest of American military involvement in Vietnam--made, per Marker's narration, "to affirm, by the exercise of their craft, their solidarity with the Vietnamese people in struggle against aggression." "[A] blending of diverse styles into a singular howl of fury," (Melissa Anderson, The Village Voice) the film brings together an array of contributions, none individually credited, under a unified editorial vision. "A panoramic study of the conflict," (Slant Magazine) the elements span documentary footage shot in North and South Vietnam and at anti-war demonstrations in the United States; a fictional vignette and a monologue that dramatize the self-interrogation of European intellectuals; interviews with Fidel Castro and Anne Morrison, widow of Norman Morrison, the Quaker pacifist who burned himself alive on the steps of the White House in 1965; reflections from French journalist Michele Ray; and a range of repurposed media material. 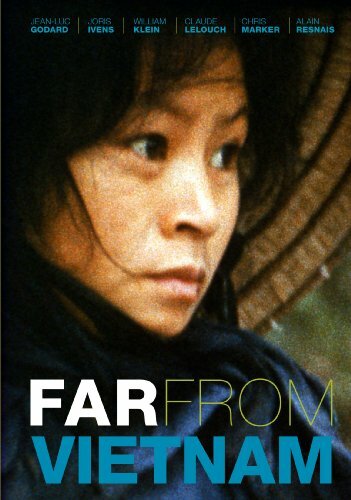 Passionately critical and self-critical, and as bold in form as it is in rhetoric, Far From Vietnam is a milestone in political documentary and in world cinema.